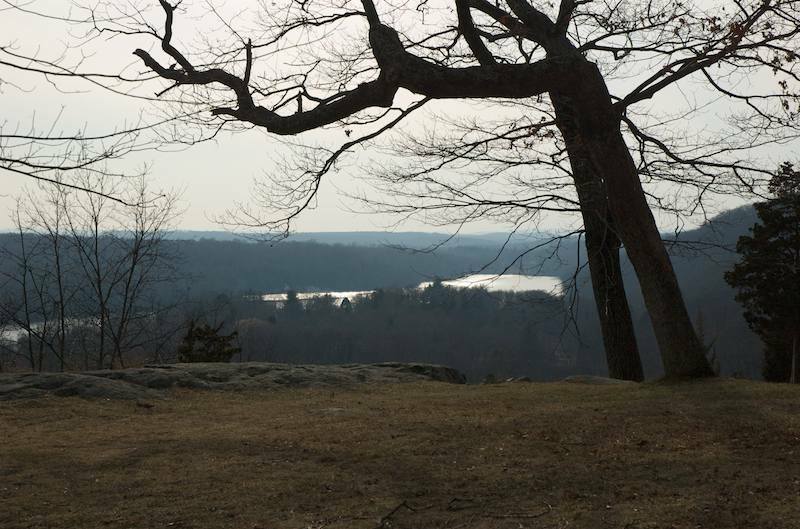 The 1,082 acre Mountain Lakes Park is Westchester’s northernmost county park. Located on Hawley Road in North Salem, the park spans both North Salem and South Salem, NY and borders a Town/Boy Scout park on Rippowam Road in Ridgefield CT that has parking and trail access to Mountain Lakes Park. It is characterized by a rugged landscape and native hardwood forest with miles of trails. There are several vistas overlooking the nearby three lakes: Waccabuc, Oscaleta, and Rippowam. From the highest Lookout you can also see Truesdale Lake further to the south. Click here for a map of the park. Or you can download one here from this site. There are several entrances to the park, two in NY and one via the previously mentioned park in Ridgefield, CT. The main entrance and the CT entrance are marked on the google map at the end of this article. Coming in from the main entrance on Hawley Road, you can park at the bottom of the roadway. You can also take the roadway up to several different parking lots at the various campsites at the park. The campsites are used in the summertime by different groups who arrange to stay at the camp for a week or so at a time. You can read about one camp, Camp Morty, at the Westchester County Parks website. The trails at the park are mostly very wide with a gravel base. There are several single track trails but they seem to be the exception. Running the entire perimeter trail covers about six miles of trails. Let us know in the comments about specific tracks you have taken through the park. This park is mostly off the beaten track and is huge – not as big as Pound Ridge Reservation, but lots of open space around the park boundaries makes it feel expansive. Don’t forget to take in the scenic overlooks and do some bushwhacking!